The one and only tool for two-way, real-time synchronization between user story maps and Trello board. See the big picture and rediscover your product. 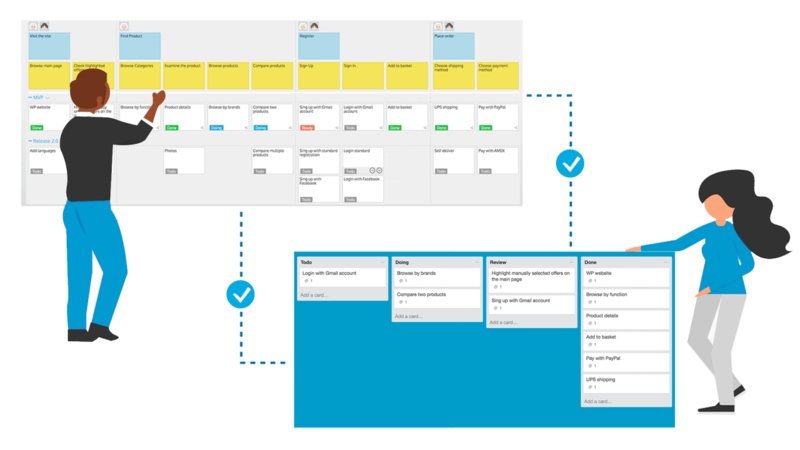 "Before we adopted story mapping, we were misusing Trello to handle both our in-sprint workflow and our longer range workflow across multiple boards, and while Trello is fine for our in-sprint workflow, every attempt to use it for the longer range planning would be a false start." Sign up and try out all features for free. Discover activities. Specify users' main activities then split them into smaller user steps. Organize steps into a narrative flow to find holes in the product. Explore the product. Fill your backlog's body up with task cards. Prioritize tasks. Move important tasks ahead others on your story map. Slice out viable/working releases. Determine the MVP and organize the rest of the tasks into working or tangible releases. StoriesOnBoard will synchronize card statuses on the backlog during the development process. Follow projects progression on the board and detect delayed tasks. Progression tracking on story map is always easier than on Trello board. Once you have set up synchronization, you are able to send tasks to your Trello board. One of the biggest benefits of the integration is that you don't have to flood the project management board with all tasks. When developers finish all tasks, clean the board by archiving cards. You can archive or delete the cards without losing data, StoriesOnBoard preserves tasks on the product backlog. Create user story map from scratch by collecting activities and user steps. Follow the narrative flow to get whole journey. Import Trello cards and arrange them below activities. If there is no task beneath a user step, there should be a missing feature. Explore what feature can solve the step or how a feature can serve a better user experience. So you've found holes and solved the issues but what's next? You'll get tons of opportunities after story mapping. Get ideas how to improve your product. Putting new tasks directly into product development workflow is the worst solution. First things first, import cards into the story map. StoriesOnBoard organizes tasks into columns for a better view. While a scrum team is working on a sprint the scrum master can collect feedback and ideas. SM keeps unscheduled and unestimated tasks away from the dev team and avoids losing the pace. Read more about the process in StoriesOnBoard Blog.